Solar energy growth continues its strong growth. For the 30 years from 1979 to 2009, solar energy has grown 33 % CAGR (compound average growth rate). For this decade, over 40 percent is forecast. Although 2009 was hurt by a sever recession and difficulty in financing large projects, most additional power brought online in the United States, Europe, and much of Asia was renewables. 32 GW of solar power is installed globally; 7.2 GW was installed last year. I joined 2,500 conference attendees at Intersolar North America, a premier exhibition for solar professionals. The co-located Intersolar North America and SEMICON West events, which took place this week in San Francisco, presented over 700 solar exhibitors to more than 20,000 trade visitors. 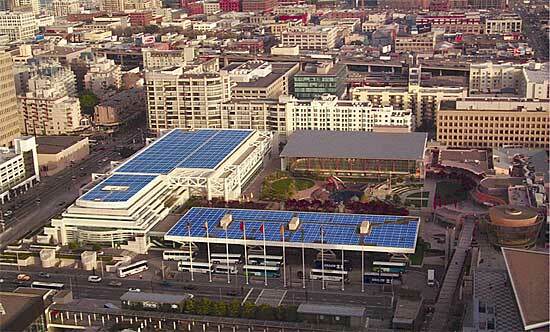 The exhibition took place at the Moscone Center, LEED certified conference center with 675 kW of solar on the roof (yes, I climbed on the roof and saw the acres of Sanyo and Shell solar panels). Equally impressive is the 80% improvement in energy efficient lighting at the conference center. Germany leads the world in buying most of each year’s solar production. German businesses and homeowners make money installing solar and then selling excess kilowatts with guaranteed feed-in tariffs (FIT). Although Germany is now reducing FIT rates, the cost of installing solar is dropping even faster. Germany will continue to lead in adding solar. With help from Italy and other countries, Europe will buy over 80% of solar PV in 2010. Only 6% of solar will be installed in the U.S., even though we have enough sunlight to power the entire nation. An excellent summary of the solar market is Renewable Energy World’s Solar PV Market Analysis by Paula Mints, Navigant Consulting. U.S. innovation has been a key driver for solar. First Solar’s CdTe thin film has brought manufacturing cost below $1.00 per watt. SunPower has achieved record 24% commercial efficiency. Key inventions of PV and semiconductors are from the U.S. Innovation continues everywhere from universities to venture backed start-ups. Optimistic presenters predicted that their technology would reach 50 cents per watt to make. Balance of system and installation costs could double or triple that number. A major issue for start-ups is difficulty in getting projects financed. Risk aversive lenders often prefer established companies who can back 20-year warranties, to start-ups with the perceived risk of staying in business 20 months. Installed PV is expected to drop from around $3 per watt today to $2 per watt in 2014. Despite all the innovation taking place in the U.S., it is less expensive to manufacture in Asia. Navigant estimated that 77% of solar PV is made in Asia; only 5% in the U.S. Asia’s lead is likely to grow, with companies with integrated supply chains like Suntech and Sharp playing major roles. PV growth is likely to be over 40% annually this decade. Solar is now 100X less than in the 1970s. The learning curve continues with costs falling 20% each time volume doubles. Industry leaders are squeezing out costs in everything from panels to paperwork, from inverters to mounting. Now, 95% of PV is grid connected, by 2014 it will be 97 to 99%. Smaller residential solar in the U.S. has been seriously injured by the wonderful companies in the middle of the recent mortgage crisis, namely Fannie Mae and Freddie Mac, who have stopped city PACE programs around the country that made residential solar affordable. If you want to laugh or cry about how the U.S. is giving the solar industry to Asia, take a look at PACE NOW. Utilities will also continue to invest in large scale solar PV and concentrating solar power. In much of the U.S. large solar cannot compete with large-scale wind. There is 20 times as much wind power installed in the U.S. Utility-scale projects also face years of delays due to NIMBY (not-in-my-backyard) opposition to the renewable projects and the high-voltage lines needed to transmit power to major residential and industrial centers. Intersolar Exhibitions and Conferences will take place in several locations over the next 12 months and return to San Francisco next July. In 2011, we are likely to see that solar grew strongly from rooftops to utility scale projects. Truly impressive is solar energy’s decades of growth that exceeds 30 percent annually. Efficiency continues to improve and cost continues to fall. Energy is more secure as generation moves closer to consumption in homes, commercial centers, and transportation.